MANILA, Philippines - The Light Rail Transit (LRT), Metro Rail Transit (MRT) and Philippine National Railways (PNR) schedule has been released for April 1 - 6, 2015 ( Holy Week) operations. Light Rail Transit Authority (LRTA) Spokesperson Hernando Cabrera announced on Twitter that last train schedule (LRT 1 and 2) is 8:00 PM on April 1 (Wednesday) and there will be no operations from Maundy Thursday to Easter Sunday , April 2-5, 2015. 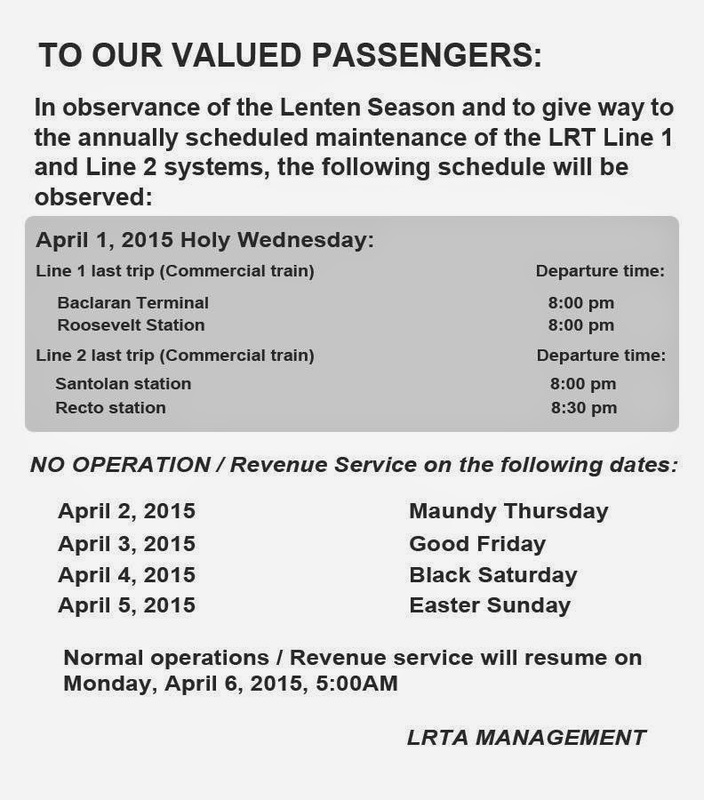 LRT1&2 Holy Week Maintenance Sked: Apr 1(Wed) - open but last train is at 8 PM. Apr 2-5 - no operations. Apr 6 - resume operations. "This is also to give way for the annual scheduled maintenance of LRT 1 and 2 systems," LRTA stated on Facebook post. The normal LRT operations will resume on Monday, April 6 at 5:00 AM. Meanwhile, DOTC-MRT3 also advised that there will be no MRT operations/revenue service on April 2-5, 2015. Regular Operations will resume on April 6. On April 1, the last trip from North Avenue station will be at 7:40 p.m. while the last trip from Taft Avenue station will be at 8:20 p.m. The LRT1 is the oldest mass transit system in Southeast Asia that runs from Baclaran in Parañaque City to Roosevelt Avenue in Quezon City. Meanwhile, LRT 2 stretches from Recto in Manila to Santolan in Pasig City. MRT runs along EDSA from Taft Avenue in Pasay City to North Avenue in Quezon City. PNR also announced that Metro South Commuter Line (MSCL) will operate until Maundy Thursday but with fewer trips. The MSCL will suspend operations from April 3 to 4 and will deploy fewer trips when it resumes operation on Easter Sunday. MSCL will resume normal schedule on April 6. The PNR Bicol Commuter Train Service will operate as usual until Maundy Thursday and suspend operations on Good Friday and Black Saturday. The BCTS will resume normal operations on Easter Sunday. The Metropolitan Manila Development Authority (MMDA) has lifted the number coding scheme on April 1-3 and 6. The Pasig River Ferry will be operational from April 1 - 5. The DPWH road repair and reblocking is scheduled on April 2, Thursday from 12:01 AM to April 5, Sunday at 12nn. MMDA Holy Week Advisories on Number Coding, Pasig River Ferry, & DPWH Road Reblocking. #mmda pic.twitter.com/SyK1G8Slnd.